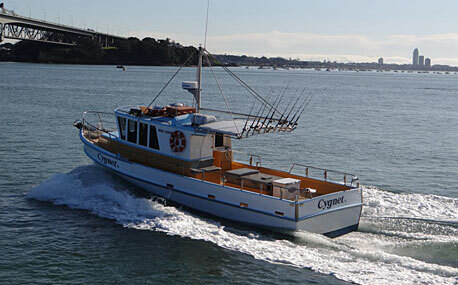 Built by McManaway boatbuilders in Picton in 2000, CYGNET II was designed and built specifically for charter fishing. This becomes apparent the moment you come onboard, with many customers commenting about the spaciousness and the practical yet comfortable layout. This vessel has not been reinvented as a charter boat like others, rather she demonstrates in many respects what a real charter boat should be. At 45 foot long and a 13 foot beam, CYGNET II is very roomy. Featured is a monstrous 15m3 cockpit with flush walkaround decks almost the full length of the boat, making ample room to fish 18 persons. The hull design is a modern "hard chine" configuration enabling "Cygnet II" to plane at 15 knots, while being exceptionally stable at rest, unlike older "ferry boats" which can have an uncomfortable roll at anchor. "Cygnet II" really does sit on the water like a swan. When the 500hp Detroit diesel engine kicks in, you are away, but still in comfort avoiding the bashing that comes with most of the smaller charter craft that are designed more for family day tripping. Enjoy the ample seating outside under cover, or in the spacious cabin, where you will find the facilities such as a modern galley, fridge/freezer, flat screen TV and DVD sound system. There is also a 4 burner BBQ in the cockpit. CYGNET II also features a separate private walk in bathroom off the cockpit, with a full size domestic house flush toilet and hand basin. This is a feature not found in most smaller charter boats that do not have the luxury of this extra space. Ladies especially will appreciate this facility. Our charter boats are operated under the New Zealand Safe Ship Management system. Naturally you can expect all our safety equipment and processes are to the highest order and we are proud to have the highest safety rating available. 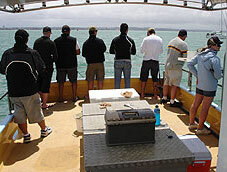 Finding fish on our Auckland fishing charters is done with some top rate electronics from FURUNO and NORTHSTAR. A large chart plotter crammed with all of our spot X's, a high powered colour fishfinder and radar conclude the list. Fishing tackle from all of the top agents with soft bait rods and baitfishing combos available for all. The best bait that works can be ordered for your trip and fish are slurried in a large ICEY TECH cooler. 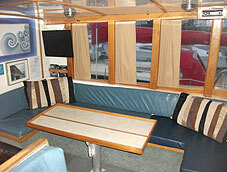 On CYGNET II your time out charter fishing in Auckland will be more relaxing, comfortable and productive. With our experience and this fantastic craft, all customers who come onboard enjoy the extra fishing features that this charter boat offers them, making their time on the water the best it can be. Enquire now to arrange your trip. "A Charter Boat for Serious Fishing"
Fulfilling the requirement to have a sportfishing craft to cater for smaller groups who may appreciate versatility in their fishing options including chasing workups for Snapper and Kingie action in the Hauraki Gulf, or gamefishing for Marlin and Tuna on the famous West coast off the Manukau, our boat REEF RUNNER was commissioned. 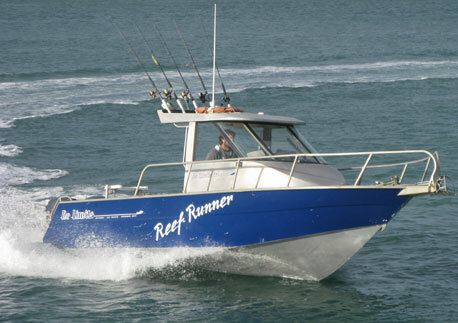 REEF RUNNER is a 27ft aluminium centre cabin hard top vessel built by "EXTREME BOATS" with deep walkaround decks. This allows fishers easy access all around the boat to flick softbaits into workups, crank lures and strayline around the entire boat, reducing tangles and wet feet that are a feature on charterboats that rely on a "wet deck" at the transom. The hull has unique built in flotation, a deep V and a flooding keel making the boat ride extremely comfortable while still stable at rest. Powered by twin Yamaha four stroke outboards REEF RUNNER can get you to the action at over 35 knots!, giving you more fishing time. Fishfinding equipment includes a Raymarine Chartplotter and fishfinder, crammed with Spot X locations used in conjunction with your skipper Eugen de Bruyn and his 22 years of local knowledge. Tackle includes quality Shimano and Penn gear, with Black Magic terminal accessories. REEF RUNNER is also available for gamefishing from December to May , and has recorded some respectable catches and boat records, including Blue Marlin 241kg, Striped Marlin 161kg, Shortbill Spearfish 30.4kg, Mahi Mahi 14.2 kg. Let us show you how to catch your dream fish. If it is a serious trip for some serious fish, Snapper to Kingfish, or Marlin and Tuna, REEF RUNNER will help make your fishing trip a success.